Kevin brought the Hawk to Plastec in Port Kells to consult with Barry Clarke, Kevin Burnett and Patrick Colgan. 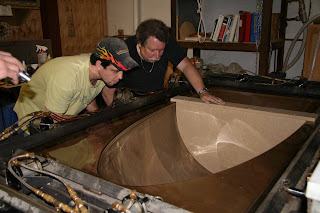 The discussions were about the nose which did not meet Kevin Knox's approval after it was re-installed after foam filling. It is slightly larger than expected (1/8 -1/4 inch). After a brain storm pasted it was decided to change the way it joins to the body and to remove some material at the rear of the cone. 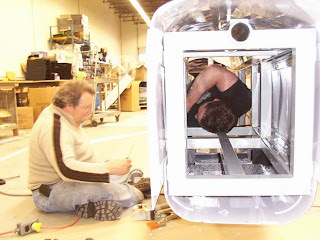 Here you see Kevin shows Barklee the much improved rear portion of the fuselage. Today, Pat and Kevin were back at Diversions, made the changes and were quite happy with the results. Thanks for the effort on a Saturday of a long week end. 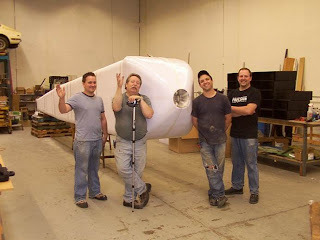 Derrick filled the nose cone in stages to keep the heat at a manageable level and avoid cracks forming. Good job, Thanks Joshua and Derrick. The former Port Rowan Ontario native, Derrick Coles, has six plus years of experience under his hat with the over sprayed peak. He has been here in beautiful BC for only 4 months, but he says he is going to stay here. Derrick was associated with Mike Antone, the superintendent back in Ontario before moving to Vancouver. Ontario loses another one to the West Coast! 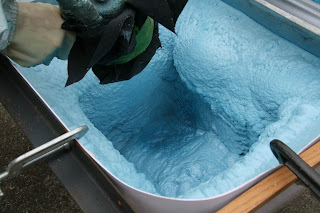 GREER Contracting spray foam experts. 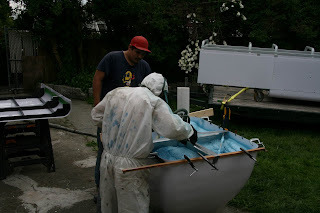 Right on schedule our newest sponsor attends to the application of Spray Urethane Foam to strengthen the nose cone and insulate the upper body panels against the searing heat from the turbocharger. 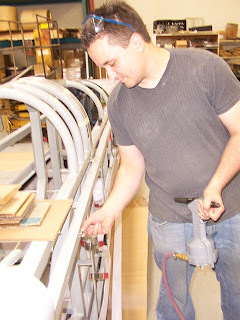 Joshua Malcolm, an apprentice in the foam spray field, is very careful to mask the upper panels before they are filled. You can see the foam as it expands in place. 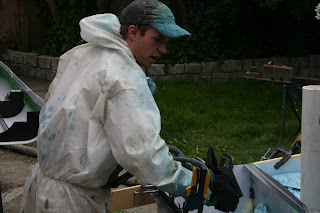 Mr.Malcolm is from Coquitlam , a former carpenter, he is eager to pick up all the skills required to be a pro. Notice that it is RCAF blue! A Surrey ornithologist's curiosity lead him to a backyard garden in Surrey where he reported siting a rare species of raptor, the young golden hawk simple is skin and bones. It appeared that a human was massaging it ever so gentle and with quiet soothing words assuring it that it's nose would change as it grew older and that it would someday soon be a glorious GOLDENHAWK. 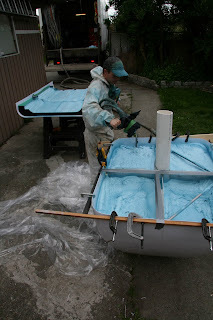 GREER CONTRACTING LTD. to foam the "HAWK"
The foam crew is on it's way to spray the foam in the nose and upper panels. Thanks to Dan Greer and his trusty superintendent, Mike Antone we will get professionals Urethane Foam application crew to apply to products on site at Diversions. Kevin Knox will be there to brace the nose so that it doesn't distort. I will have photos in the update. Steve Zaeri owner of COOL-IT Hi Way Services and to see his new shop for Truck Lube & Oil that will be opening soon. Steve manages the COOL-It shop for the cooling requirements of all sorts of Highway transports and reefer units. However, Steve is also the very first person to endorse this project when it first emerged as an idea 5 years ago. At that time I suggested we put a/c in the car to keep the driver cool and to draw interest to his business. 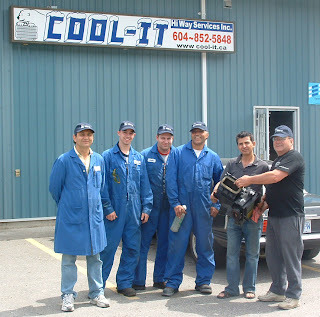 Today you can see the 300 mph air conditioner unit being presented to the Goldenhawk streamliner project by the team at the COOL-IT Hi way Services in south Abbotsford BC. Thanks to Jeanette for taking her lunch break to shoot the photos. Kevin Knox of Diversions is making great progress in the touch ups to the body. 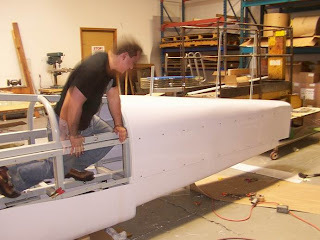 Thanks to the Observations of Larry Schroeder, we discovered an obvious problem with a frame tube which was putting stress on the rear section of the fuselage. Kevin broke out the trusty die grinder on Monday and trimmed a bit off and like magic the body is fitting good. 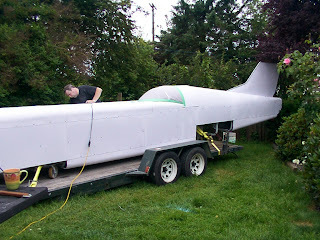 The foam company is coming to fill the nose cone on Thursday and the paint experts are expected about the same time. Then the car will go to the body shop and be stripped of the body and the frame will go back to Aggressive Tube Bending for mounting all the various bits and pieces like the fire system etc. As was posted earlier Alana & Robyn are biking to Bonneville Speed Week. Here is a link to their blog so you can follow their adventures. Go girls, sun burnt and sweaty and having a blast! Friday the chassis with the body on it left Plastec's plant in Port Kells on board the Apex Refinishing trailer towed by that same blue truck with Werner Sprenger at the wheel and Kevin Knox in his big bad Dodge 4x4 acting as pilot car. Hauling a 30' long, Bright White Sports Car through rush hour traffic may cause other drivers and passengers to suffer whip lash, therefore no photos were taken but we can tell you that it is now in the capable hands of Diversions (www.kevinknox.com ). 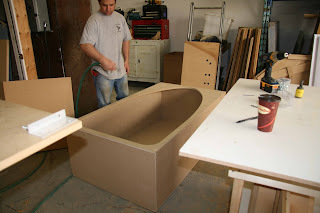 While at Diversions Kevin will put the final touches to the body which he designed and fabricated. This project owes a great deal to many but none more than KEVIN KNOX! Kevin is multi talented and has all the "toys" to design, 3D scan, and make any scale models or rapid prototype anything you need in a hurry. It is all done here in Surrey, BC. Canada great for reproduction of classic parts for model railways, restorations or your favorite jewelery. 230" Mark Williams built. Set up for hemi or chevy,4 -16" centrelines M/W 9"35 spline and spool, Ross powerglide, new seat , no engine. May consider trades of interest. Best record held 6:21sec @ 236 mph. We are seeking and individual or company to sponsor the the team for driving suits and personal safety equipment in exchange for official sponsor status and to join in the team. For the company in the diesel fuel sales or bio diesel there is an opening to be fuel sponsor. Bio diesel will be considered, for the transport and will test on dyno for race engine. TRAILER 2 year lease, used 48ft with rail gate would suit. The Goldenhawk project is seeking a sponsor for the transporter. A large trailer with a power lift and a side door,not exactly as shown. It will be turned into a theatre for showing the big screen version of :Discovery Channel's documentary and equipped with a lounge in front. Great for trade show entertaining by sponsors. Highway tractor, two year lease, with large sleeper to tow the trailer and supply aux power for the theatre. Opportunity for Truck driver, Hosts and Hostess at certain venues, hospitality experience helpful. It was danger management and fire was allows an issue. We needed Acme fire protecting us back then. Found this while browsing the web and found it really interesting. One TopFuel dragster's 500-inch Hemi makes more horsepower than the first 8 rows at the Daytona 500. Under full throttle, a dragster engine consumes 1 1/2 gallons of nitro per second, the same rate of fuel consumption as a fully loaded 747 but with 4 times the energy volume. A stock hemi will not produce enough power to drive the dragster's supercharger. Even with nearly 3000 CFM of air being rammed in by the supercharger on overdrive, the fuel mixture is compressed into nearly-solid form before ignition. Cylinders run on the verge of hydraulic lock. Dual magnetos apply 44 amps to each spark plug. This is the output of an arc welder in each cylinder. At stoichiometric (exact) 1.7:1 air/fuel mixture (for nitro), the flame front of nitromethane measures 7050 degrees F. Nitromethane burns yellow. The spectacular white flame seen above the stacks at night is raw burning hydrogen, dissociated from atmospheric water vapor by the searing exhaust gases. Spark plug electrodes are totally consumed during a pass. After ½ way, the engine is dieseling from compression - plus the glow of exhaust valves at 1400 degrees F. The engine can only be shut down by cutting the fuel flow. If spark momentarily fails early in the run, unburned nitro builds up in those cylinders and then explodes with a force that can blow cylinder heads off the block in pieces or split the block in half. 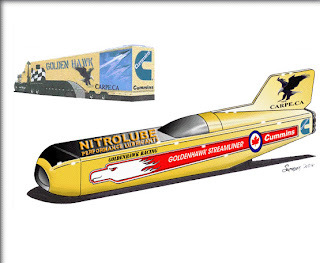 To exceed 300 mph in 4.5 seconds dragsters must accelerate at an average of over 4G's. But in reaching 200 mph well before 1/2 track, launch acceleration is closer to 8G's. If all the equipment is paid off, the crew worked for free, and for once NOTHING BLOWS UP, each run costs $1000.00 per second. Dragsters reach over 300 miles per hour before you have completed reading this sentence. Top Fuel Engines turn! ONLY 540 revolutions from light to light! The red line is actually quite high at 9500rpm The current F/T dragster elapsed time record is 4.477 seconds for the quarter mile (06/02/01 Kenny Bernstein) Putting all of this in perspective: You are driving an average Lingenfelter powered "twin-turbo" Corvette. 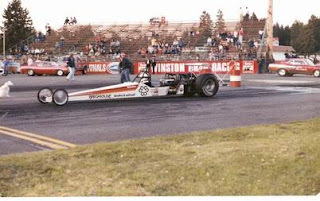 Over a mile up the road, a Top Fuel dragster is staged and ready to launch down a quarter mile strip as you pass. You have the advantage of a flying start, but you still run the 'Vette hard up through the gears and blast across the starting line and past the dragster at an honest 200 mph. At this moment, the dragster launches and starts after you. 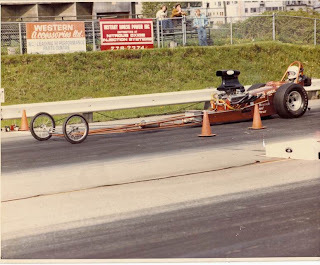 You keep your foot hard down, but you hear an incredibly brutal whine that sears your eardrums and within seconds the dragster catches and passes you. He beats you to the finish line, a quarter mile away from where you passed him. That folks, is acceleration. Think about it, from a standing start,! this phenomenal machine has spotted you 200mph and not only caught, but nearly blasted you off the road when he passed you within a mere 1320 feet. Now....., tell me about the time you spun the wheels and laid rubber on dry concrete. If you race one of these drag cars you must have deep pockets or a big time sponsor. The Goldenhawk has no cash sponsors, but are thankful for the great group of volunteers and suppliers, that have become friends and that's worth more than cash. New sponsors to be announced soon. We will be adding a printing and a foam insulation company, major paint supplier and a body shop for you to see next week. Also Piers Harry expects he will dyno the engine, and Lone Star will do more sheet metal fabricating. Mean while Apex Refinishing is powder coating the wheels that Green's made. Good Year assures us the tires are coming. It will be a race to get the overdrive machined but we are hoping for OTT to get the time to complete in time and keep up on their other work load. Go Ben Go! 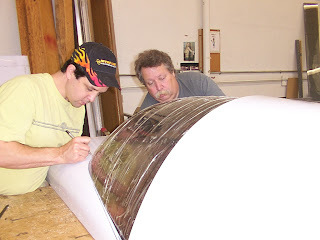 The Two Kevin working on the trimming of the canopy to fit in the cockpit cover. It is very trying work. 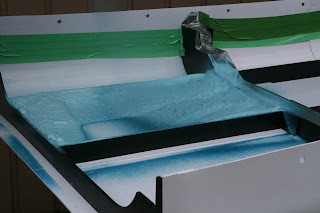 The body was moved into the hot sun to monitor expansion and to allow the material to anneal to reduce the stress and allow it to shrink some of the stretch marks before final trimming and filling joints. Friday it will go for interior panels and then to the body shop for prep and paint of the gold. This is Aaron, Amanda and Matthew, Aaron is only two but his dad says he is certifiably car crazy. Dad is a computer accountant for a large machinery dealer, but last night he took his own time and put together a powertrain calculator for me to assist in the cam shaft and engine specifications. Many thanks to Matthew for stepping in to help without any notice. 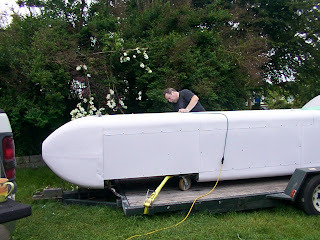 Today Kevin Knox reports that he is hours away from completing the body and the canopy will be fitted tomorrow and perhaps the nose will be foam filled for strength. Ben Olson reported that he and Chris would be finished the differential and pinion oiling system and hopefully all the steering and gearing from OTT INDUSTRIES will be in our hands by Thursday. Piers Harry, reports that he has been working on the fuel pump and will pull the cam for Colt Cams to perform their magic. Actually, Geoff is a scientist, not a magician. Yesterday, Jim Walker reports that he has recruited a cash sponsor which will help pay for the four wheel heavy duty 4 piston disc brake system that we bought today. Tomorrow, Dino, the painter will drop in to assess his job and Steve from COOL-IT Hiway Services is going to attend in the morning to start the air conditioning. The pressure is on and people are responding accordingly. 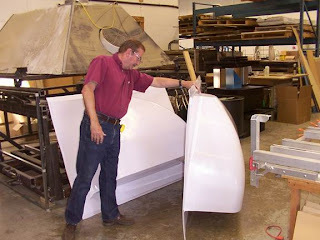 Kevin Knox of Diversions designed the tail section in 3D before Pat Colgan, using the information file CNC'd the side panels and then Kevin fabricated the structural components of the vertical stabilizer. Randy and Werner marvel at the way the car looks like the Daryle Sorenson's renderings in the image on the Global Inkstorm banner hung on the wall behind. Yes, it does look like it needs wings and a dashing hollywood star in the cockpit. 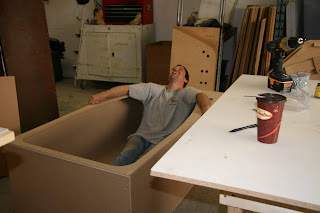 A well deserved and playful moment of rest for Kevin Burnett at Plastec. It all started here, some two years ago when Barry suggested I speak to Kevin before I designed the new car. That meeting was to discuss the various methods of making a canopy. "No compound bends, they would be very difficult and no one he knew could do them" said Kevin. However, he did say that it was possible to form ABS with radii that would be trim able into the body panels. Now, after what started as a creative challenge, many hours of planning, computer designing , experimentation, anxious stress and very large vessels of coffee, the Goldenhawk has a parabolic shaped nose cone and a smoked polycarbonate canopy, that is optically correct. GUESS what? He made both of them with compound curves! 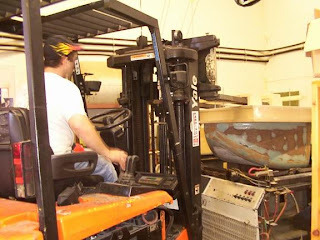 However, Plastec did buy a new forklift just to produce the nose cone. Good job, enjoy the rest because now you have a large back log of projects to complete. 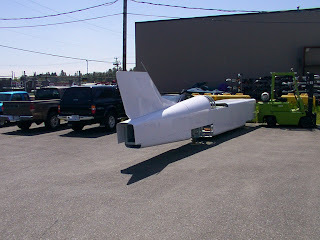 Note to those with wind cheating canopy needs, Plastec can make them and for less than military surplus prices. See the website for contacts. First make a tool to form the part. Next make a trial run. Then check out the perfect POLY CARBONATE CANOPY. Jeff, Pat, Kevin B. (made the tool) and Kevin K. look pretty pleased with the outcome. They should be pleased the first attempt at something no one else would try and it is beautiful . GREAT WORK GUYS! 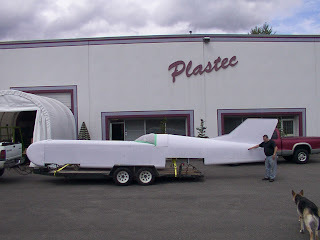 Barry Clarke, owner of Plastec takes a moment to consider how much this thing resembles a Spitfire or some old fighter plane. You can see his project high in the background. Maybe there is going to be a completion of that project soon? 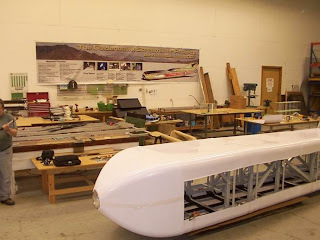 It is now official Piers Harry and Werner Sprenger are planning to make the Landspeed record in E/DS. 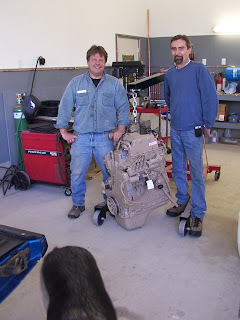 Piers will work his well known magic on this 3.9BT Cummins and turn it into a raging record setting power plant for the GOLDENHAWK (Pierce-Arrow) streamliner. Now maybe that should be PIERS-ARROW? 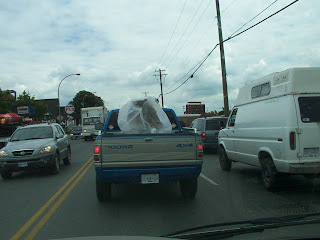 Today a certain blue Dodge pickup truck was spotted leaving Cummins Western Canada in Port Kells BC. The cargo was wrapped up so as to not be recognized but when we spoke to the driver, a Mr. Werner Sprenger he would say only that it was an industrial 4 litre diesel pump engine. 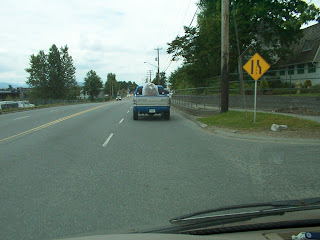 our intrepid reporter followed the pick up to a location in Langley B.C. MORE news to follow!! We haven't seen Werner for a couple of days because he is busy locating and procuring all sorts of parts and safety equipment. A better crew chief there is not, he knows what needs to be done and with rule book in hand goes a hunting. I am thankful for a great neighbour as well as a good guy. Tomorrow morning Werner will pick up the engine from Cummins and deliver it to Piers Harry so he can work his trademark magic on it. 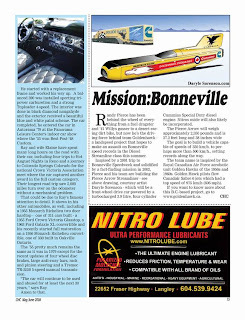 See this issue of DIESEL POWER magazine to check out one of the wicked drag strip Cummins/Dodges he has powered up. I will be impersonating "Rosy the Riveter" at Plastec. Kevin Knox will be finnishing the body panels tomrrow and Kevin Burnett is planning to pull the canopy from his new mold. 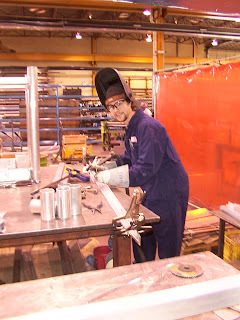 Once again Aggressive Tube Bending is there for the project. 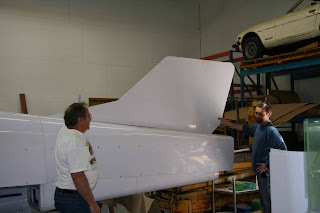 When Kevin Knox and Barry Clarke at Plastec designed the mounting plate for the tail, we went to see Peter Diesing and Bob Georgison at Aggressive. 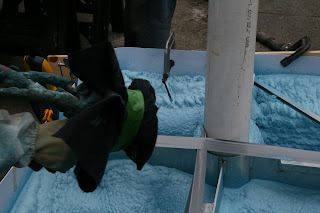 They immediately responded and in minutes Sean Scott was rounding up material and welding the anchor spar. Thanks to each of you to your 'get the job done attitude! 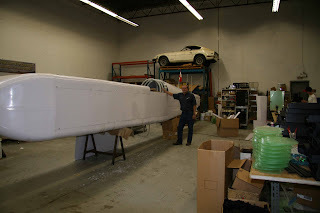 Kevin Knox has been a great asset to the project, not only did he do the computer drawings in 3D and assist in the designs, attend at the building of the chassis but he also scanned parts to make prototype models. Here he is 3D scanning the transmission and then he can reproduce it in scale on his Rapid Prototyping equipment. 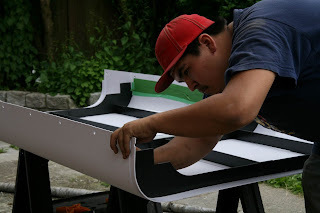 Thanks Kevin for taking the weeks out of your company schedule to build the body of the car as well. Federal Battery supplies the power. Chris Scullion Owner of Federal Battery in Richmond and Werner discuss the best possible battery set up for the Goldenhawk stream liner. A visit to their shop is worth the trip. You might say that the diesel project is getting cranked. New sponsors to be announced. It will possible that the Goldenhawk will be fuelled with Bio diesel made right here in BC. We have a new sponsor for the Batteries and electrical parts. We have a very special hot rod and custom shop to sponsor the paint works. Now all we need is the sponsors that have nothing but money! Check out the revamped website and the sponsor links. 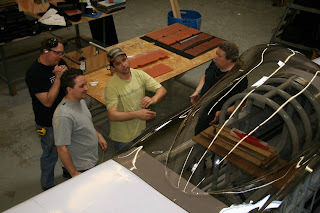 Today as Kevin Knox and Patrick Colgan worked out the ramifications of the rear sections of the body at PLASTEC today and Kevin Burnett was experimenting with the Lexan Polycarbonate sheets for the Canopy, we received a call from Global TV requesting to report on the project. I am ill with the spring cold, so I asked that they delay the shooting until next week when they will be able to show the body not just the frame. 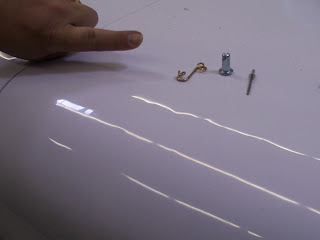 Theses are the little fasteners that will hold the body panels on the chassis as Pat demonstrates. Larry and Pat look it over and Larry says "It looks like the Daryle Sorenson rendering in the Banner by Global Inkstorm". 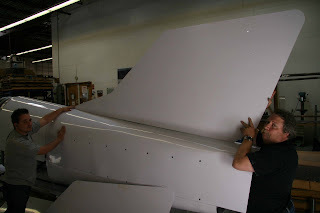 The crew is working on the canopy to finish the cockpit and tomorrow Kevin Knox and Pat will begin to form the top at the rear and the vertical stabilizer. The Fasteners arrived from Florida today so I will drag my spring cold to Plastec and begin to rivet the springs on to the frame. Then the final trimming and filling can begin. I think by the end of the week we will be looking for a company to spray it gold. The great white (sports car) whale is born? The body is on the bottom and the nose is trial fitted. The intrepid group of (l-r) Pat, Kevin K., Kevin B, and Jeff are smiling and cracking jokes as the talk is of giving birth to a great white 30 foot whale. It is very impressive in size and unusual in shape because most streamliners are pointed on the front and wide on the stern. If you think about it the smaller the stern the less drag. We shall see what happens on the Salt Flats at speed. 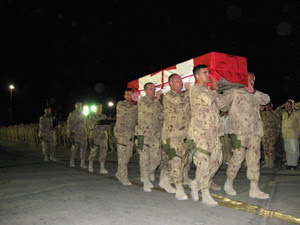 Military Photographers worldwide mourn loss of one of their own! postscript . I was never in war, but the toughest assignments were always coverage of the funeral of a serviceman as his family lay him to rest. The flag ceremony (presenting the draped ensign ) to wife or mother used to tear me up such that camera operations were accomplished by habit and speaking was out of the question. Delays are normal but Deadlines loom. Yesterday we had meetings and conferences on the engine preparation and specific parts with Cummins and the "Master of Engines" are newest sponsor powertrain crew leader. 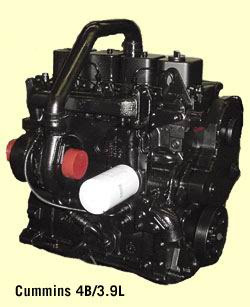 It will be a tight build schedule due to workload changes in the Industrial engine business. With some stress,sweat and pressure we will pull it off. I am hope full we will get the completed front drive back Saturday and the custom overdrive assembly next week. 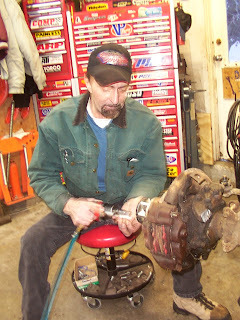 Steve Troyan will whip up in transmission in a few days and then we will have to set the steering box and build and install the steering wheel in the cockpit. There is a lot to do and only our friends at OTT INDUSTRIES, LONESTAR, PLASTEC, COLT CAMS, CUMMINS, AGGRESSIVE TUBE BENDING, KOOL COAT, NITROLUBE, APEX FINNISHING, ACME FIRE, Troyan Performance Specialties. can make it happen! I am holding my breath until we load up to head for the salt. 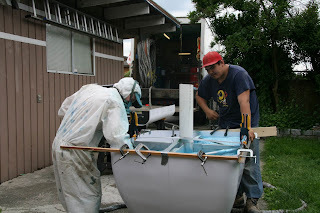 'Huston We Have (nose cone) Lift Off"
Here is how to make very large pieces in the vacuum former. First you build an outrageous tool, then you build a vacuum chamber for the top of it , then you turn it upside down and lower it in the machine with the fork lift because it is too large and heavy to form it the normal way. 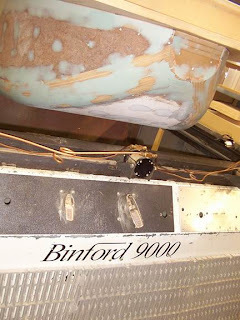 Heat up the "binford 9000" (watch Tool Time for Tim & Al's version) with the ABS sheet and presto, one half the nose for a LAND SPEED RACER. 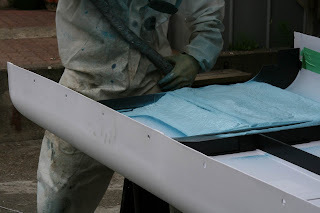 It was not easy and took great imagination on the whole team at PLASTEC. Everyone was involved including Margaret who videoed the first ones and cheered the crew on to success. Jeff, Pat, Kevin and Barry pulled it off . 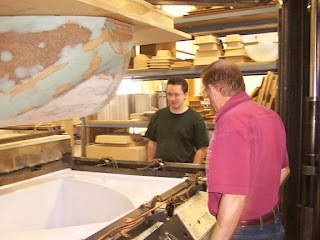 Barry is seen inspecting the finished pieces. 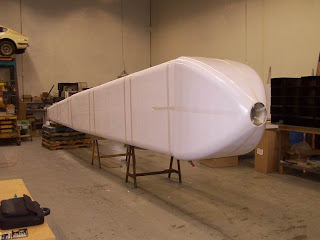 Now they will be trimmed and joined together to make the nose cone. 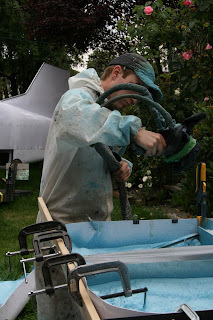 Kevin is now moving on to the canopy and Pat will continue with the upper tail section and the fin before it is all reassembled to sand and prep for paint. There is nothing like a looming deadline to get things accomplished. THANKS to everyone at PLASTEC for the team on the car and the others who are keeping the customers orders flowing out. 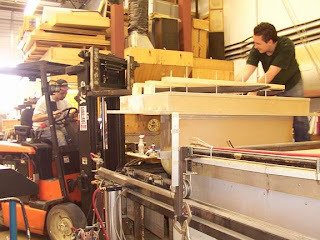 I am proud to recommend you to anyone who is seeking normal plastic products or fabrication. Don't forget top quality costs less in Canada!